First is temperature of the water. The machine takes care of that for me. Check. The next is how long it takes for the water to run through the grounded beans. This should be around 25 seconds. Your personal taste may make it a bit higher or lower. Now I've got the grinding of the beans, and how coarse or fine that should be. Does this affect the taste directly, or is that just one parameter combined with how hard the beans are pressed, that goes into how long the water takes to run through? Or does this by itself have a more direct effect on the taste? 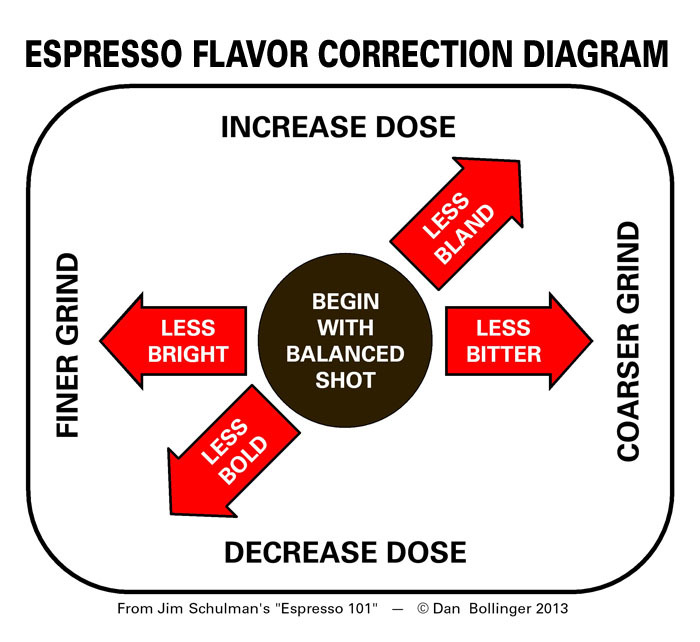 Basically, coarseness of the grind influences the balance of bright and bitter flavors: coarser reduces bitter flavours, finer reduces acidic flavours. But it all interacts with the flow rate; see the diagrams in the linked article. Tamping pressure itself is not really a factor, you should keep this constant and only modify grind and dose. Not the answer you're looking for? Browse other questions tagged flavor ground-coffee grinder or ask your own question. Why would anyone want to hand grind their coffee? Does longer brewing time with hot water negatively effect flavor? Should I press the coffee tight?